For the past 50+ years, the Webster Lake Association’s Boat Parade has been a part of our 4th of July celebration. 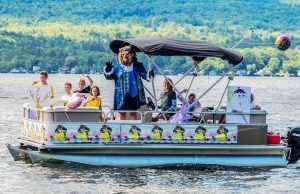 Each year’s parade has a theme and participants are asked to decorate their watercraft of any kind or their shoreline area accordingly. Participants can also use a patriotic theme to decorate. The boats travel around the lake displaying their creativity and waving to those on shore. The shoreline is usually filled with observers waving back to participants in the boats. It is a fun hour long cruise with lots of enthusiasm for our country and lake.